We have long known that biomarkers are essential for the realization of personalized medicine. And the promise of personalized medicine (more recently termed “precision” medicine) is indeed being realized, as more biomarkers and companion diagnostics are rolled out by clinical research to become commercial reality. An interesting trend is combining quantitative biomarker data and clinical readouts to provide a more detailed characterization of a disease state. This enables clinicians not only to diagnose diseases, but also to specify the subtype or causal origin of the pathophysiology, potentially leading to a more tailored course of treatment. New data-rich biomarker discovery technologies have emerged that are dramatically changing our knowledge of preclinical and human systems—information that is imperative to enable translational and personalized medicine. BCC Research predicts that the imaging segment of the global biomarkers market is the fastest growing. New initiatives are attempting to free Big Data locked up in medical images to improve clinical decision-making. In June, Microsoft announced a new partnership with MEDIAN Technologies, the aim of which is to identify biomarkers from medical images using advanced Big Data analytics. MEDIAN Technologies will install its imaging biomarker phenotyping system (IBIOPSY) on the Microsoft Azure cloud computing platform. On Azure, IBIOPSY will provide capabilities for processing and analyzing medical images, extracting biomarkers of disease in real time for cancer diagnosis and treatment purposes. IBIOPSY will be made available to medical facilities and physicians in the United States, Europe, and Asia to meet the growing demand for precision medicine analytics in cancer care and elsewhere. A new statistical tool appears to accurately predict the survival time of patients with cancer, although it will not be available for at least another year. The SURVIV (Survival Analysis of mRNA Isoform Variation) algorithm models the measurement uncertainty of mRNA isoform ratio in RNA sequencing data to predict patient survival time. In a study published June 9 in Nature Communications, researchers from UCLA reported performance results of SURVIV for six different cancer types. “Using biomedical Big Data that encompass the molecular and clinical profiles of cancer, we can identify novel biomarkers that guide cancer prognosis and treatment,” said lead author Yi Xing, MD. Dr. Xing and colleagues spent more than two years developing the SURVIV algorithm. They used histologic samples from a total of 2,684 patients with cancer. After collecting the tissues, they compared the survival time approximated by their algorithm with the amount of time the patients had actually survived. The group also included some patients who were still alive. Now the team is applying SURVIV to much larger datasets across many more types of cancers to develop more reliable isoform-based predictors of patient survival. They are hoping to discover isoforms that are consistently associated with survival in a “pan-cancer” analysis across multiple cancer types. This method could be extended to predict other types of patient outcomes, such as response to specific therapies. BCC Research shows in a new analysis that combination therapies will continue to contribute substantially to growth of the biomarkers market over the next five years. The majority of biomarkers fall into four general classes: genomics, proteomics, bioinformatics, and imaging. 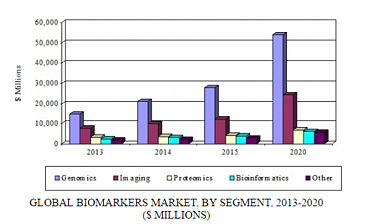 According to BCC Research’s forecast, the global biomarkers market is expected to grow at a five-year compound annual growth rate (CAGR) of 13.8% from 2015 to 2020, increasing from $50.6 billion to $96.6 billion over the period. As a segment, genomics should reach nearly $54 billion by 2020, growing at an anticipated five-year CAGR of 14.1%. The growing prevalence of infectious diseases and hospital-acquired infections should drive growth of this segment, along with other factors that include decreasing prices of DNA sequencing and an increasing demand for genome analysis in animal and plant feedstock. Untapped growth opportunities in countries such as India, Brazil, and China, coupled with the overall increase in health awareness, should also foster growth. The imaging segment should grow at an anticipated five-year CAGR of 15%, the highest rate among all segments. The increasing prevalence of cancer is a key driver, along with the emergence of personalized medicines. However, poor regulatory and reimbursement systems could hinder growth. The proteomics segment of the market is predicted to grow at a five-year CAGR of 10.5%. Finally, the bioinformatics segment should reach $6 billion by 2020, reflecting a five-year CAGR of 9.7% and the slowest growth of all segments. BCC Research’s new study, Biomarkers: Technologies and Global Markets, examines leading and emerging competitors, key markets, major biotech companies, products in development, and the overall competitive landscape. Analyses of global market drivers and trends, with data from 2014, estimates for 2015, and projections of CAGRs through 2020, are provided.